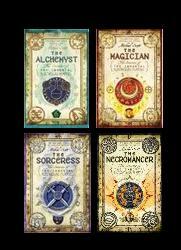 The Secrets of the Immortal Nicholas Flamel, Michael Scott, 6 volumes, Delacorte, 2007-2012. I can promise with 99.9% certainty that I’ll never post anything involving vampire romance – although William Tenn has a great short story about a doctor figuring out how to help his son, who’s in love with a vampire (“She Only Goes Out at Night,” ) – so you can be sure if any paranormal books get mentioned here, they’re clever, entertaining, and just plain fun without the romantic angle. This is where Scott’s series comes in. If you’re thinking that Flamel’s name is familiar, then you probably have a teeny echo in your mind from HP1; Flamel is Dumbledore’s fellow wizard, and owner of the Philosopher’s Stone. He was also a real person (a 14th C French bookseller), providing Scott an opportunity to play around with history. For instance, in Scott’s series we learn that Flamel’s past battles with his enemy, Dr. John Dee, led to such disasters as the great fire of London (1666) and the Irish famine of the 1800s. The protagonists here are Sophie and Josh Newman, teenaged twins who meet up with Flamel and his wife Perenelle in early 21st century San Francisco. On the very first page, we witness (through Sophie) golems helping to destroy a bookshop that Flamel owns, and then the twins are taken on a speedy ride — three volumes later, we’ve progressed only six days, but meanwhile at least three nether worlds and swaths of Paris, Ojai, and London have been destroyed, along with innumerable people and even a few Ancient Ones! Scott has peopled this world with gods and heroes from world mythologies (Egyptian, Greek, Norse, Native American, Polynesian, etc. ), as well as “immortals” — Joan of Arc, Billy the Kid, the Comte de Saint-Germain, Machiavelli, and, as the arch villain, Dr. John Dee, who was once court astrologer to Elizabeth I. They’ve all faked their deaths but lived on, to plague or help the world, depending on how they achieved immortality. The twins become the key to saving the world from Dee and his buddies (a few Ancient Ones who miss the old days of total power over humans), and we follow this brother-sister team as they learn about Flamel and their own powers. Breathless, thrilling action? Yes. Good writing? Mostly. The best part for me has been trying to guess which immortal or mythological beast will appear next and on whose side. A bit more on this series in tomorrow’s post. This entry was posted in Adventure, Fantasy and tagged Michael Scott. Bookmark the permalink.